The planet is so close to WASP-12 that the star’s tidal forces are distorting the planet into an egg shape and pulling away its atmosphere at a rate of about 10−7 MJ (about 189 quadrillion tonnes) per year. The so-called “tidal heating”, and the proximity of the planet to its star, combine to bring the surface temperature to more than 2,500 K (2,200 °C). On 20 May 2010, the Hubble Space Telescope spotted WASP-12b being consumed by its star. Despite scientists already being aware that stars can consume planets, this is the first time such an event has been spotted so clearly. NASA has estimated that the planet has 10 million years left of its life. The Hubble Space Telescope observed the planet by using its Cosmic Origins Spectrograph (COS). 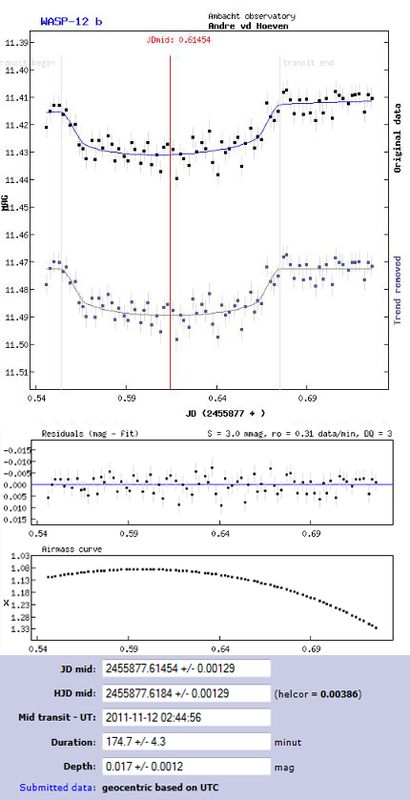 The Hubble Telescope observations have confirmed predictions published in Nature in February 2009 by Peking University’s Shu-lin Li. The planet’s atmosphere has ballooned to be nearly three times the radius of Jupiter, while the planet itself has 40% more mass than Jupiter. With the last transit I started just a bit too late to catch the real onset, so now I decided to get out of bed in time (the transit was from 2.22-5.22 local time) and wanted to start measuring at 1.20. When I gave the slew command to the scope it made a nasty ‘klunk’ and stopped responding. Apparantly the power was interrupted (bad contact) and I had to reinitialise and align the scope. Finally I succeeded only 10 minutes before the onset to start measuring, but well, it was in time. This star had a slightly smaller dip than the last one (only 0.015 magn) and would be a bit harder. Finally I could expose the images for 45 seconds without saturating the star and so I made 4 hours of 45s recordings. These images were stacked per four, to get efficiently one measurement per 3 minutes. The residuals had a standard deviation of 3 mmag, slightly higher than the last time.